Regal Marine Industries' new 24 FasDeck, one of two FasDeck models it builds, the other being the 27, is actually a renewed version of this very popular model which it just recently introduced to much market success. It is still the same overall length as the previous iteration but offers increased cockpit room, seating flexibility, and an optional electric PowerTower™. 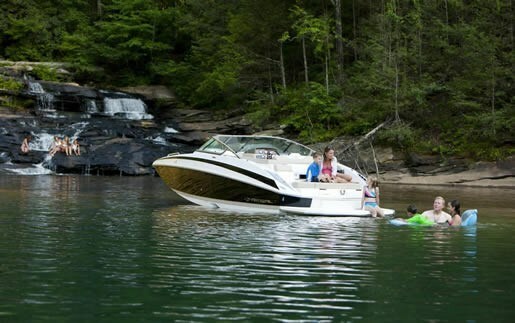 The two FasDeck models are included in Regal's fourteen models of Sport Boat bowriders and cuddies from 19 to 34 feet. Regal also offers two express cruisers in 28 and 30 feet, plus a full complement of six Sport Yachts from 35 to 52 feet. 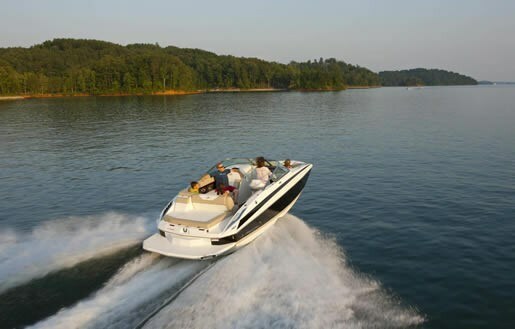 All Sport Boats up to the 2750, including the two FasDeck models, ride on Regal's patented and highly-touted FasTrac™ hull which, along with aerating the hull bottom by introducing air via a full mid-beam step to reduce drag and friction, provides other modifications to enhance handling and performance. "In independent testing with competitive models of similar size and propulsion, the FasTrac™ hull delivers up to 30% better fuel economy and 26% higher cruise speed." The amount and flexibility of both seating and storage is the hallmark of a deckboat and Regal offers both in copious quantities in the 24 FasDeck. "Regal is the only manufacturer to provide an aft facing Arena seat which enhances the social aspect of the cockpit." This high-backed lounge stretches the entire portside of the 24 from the passenger helm to the transom UltraLounge™. This lounge, a six-position, double-wide sunpad/lounge/seat features a four-position backrest that accommodates an aft-facing sun lounge, a backrest for forward facing seating, and when the backrest is flipped all the way forward, it becomes flush with the seat cushion and provides an extra 18" of length to the sunpad. Further, the aft sunpad cushion can be raised to create a forward facing lounge. Now that's flexibility! The enclosed head within the passenger helm is roomy, with decent headroom, a toilet, Flexi-teak flooring, and cherry cabinets with a sink and Corian™ countertop. Up front in the bow section, are two more side-by-side lounges with flip-up armrests plus a rear-facing centre seat and available bow filler cushion. 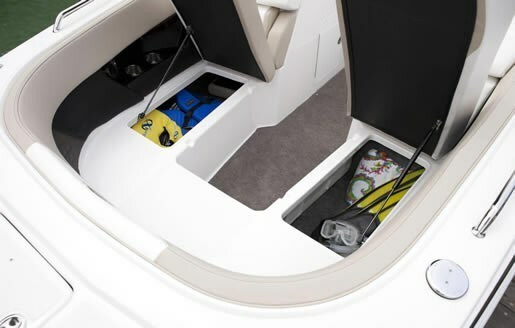 Storage is found absolutely everywhere on the 24 FasDeck providing ample room for all of the accessories associated with the myriad of watersports and family fun activities available to users of the Fasdeck. A removable 25-quart cooler is standard and has designated under-seat storage. Gas struts assist in accessing and the holding open of storage areas and hatch covers are resin transfer molded for finished surfaces on both sides. And talking of on-water fun, the huge, extended, integrated swim platform is mounted only one inch above the waterline, which along with its concealed, stainless steel telescoping boarding ladder, provides easy access to and from the water. An optional forward bow boarding ladder is available within the anchor locker allowing easy bow access while beaching. The 24 FasDeck is loaded with standard equipment, enough so that you could very well have exactly everything you need on the base boat. 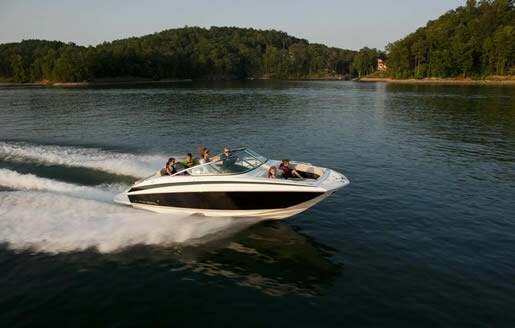 However, an extensive list of available options from Regal can outfit your boat almost precisely to your specific needs. For example, standard equipment includes "great to have" features such as more expensive and durable in-mold graphic striping and a wide selection of hull colours, so much so that your boat need never be exactly like any other on your lake. Blue courtesy LED lighting enhances the cockpit. A trash receptacle with designated storage is provided. The dash is soft-touch, hand-stitched vinyl wrapped with French stitching. A digital depth sounder with alarm is standard as is a built-in automatic fire suppression system. The standard stereo is a "waterproof" Fusion™ marine with internal iPod dock, LED display, AM/FM and Sirius satellite ready, with CD and DVD capabilities, and six marine speakers. A sport-grip steering wheel is 5-position tilt. Sunbrella® bimini canvas with stainless steel bows provides basic protection from sun and weather or choose optional full enclosure, travel cover, cockpit cover, or bow cover. Unique to Regal, trailering lights with running, brake, and turn signals are built right into the hull. 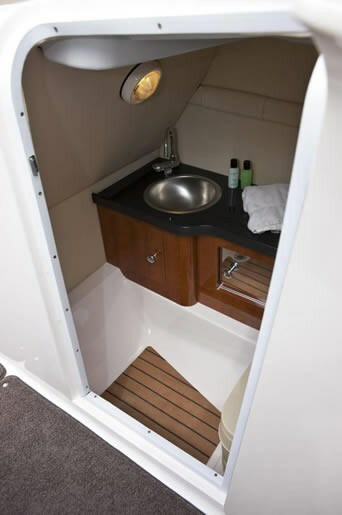 Neat options include underwater lighting, a portable teak table, stainless steel gas grill, cockpit refreshment centre with sink, storage and Corian™ countertop, transom shower and upgraded stereo. The neatest options of all are Regal's electric PowerTower™ and RegalVue touch screen display. The tower is a fibreglass arch available in white or black gelcoat with a top-mounted ski tow. This arch raises and lowers electrically for low bridges, trailering, lifts, or boathouses. It has been tested for "three times more pull strength than a traditional aluminum tower." With RegalVue, "Regal is the only manufacturer in its class to offer a multi-function touch screen display that can provide engine data, GPS with chart plotter, cruise control (Volvo only), digital depth, speed, and engine diagnostics." A video camera can be added. Standard recommended power for the 24 FasDeck is a 5.0 L fuel injected sterndrive from either Volvo Penta or MerCruiser. A 5.7 L, 300 hp is optionally available from either engine builder. Regal FasDecks are roomy, fast performers with great flexibility and few compromises.